Muskadel SA 2016 Awards: Orange River Cellars crowned Muscadel king for the second consecutive year. With the winter on our doorstep, what pairs better with a fireplace than a proudly South African wine cultivar? 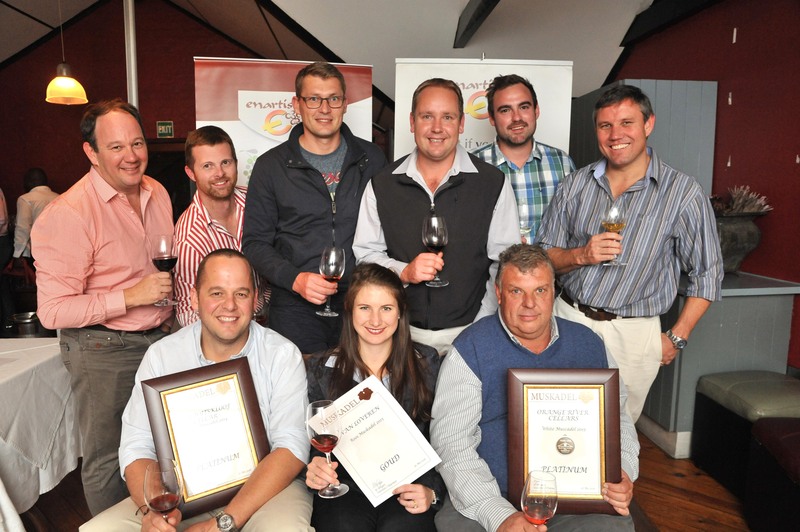 The 14th Muskadel SA Awards, sponsored by Enartis SA, was awarded at a function at Noop, Paarl on 26 May. From the 16 entries received, Orange River Cellars White Muscadel 2015 and Du Toitskloof Cellar Red Muscadel 2014 was awarded with top honours, each receiving a Platinum award. Orange River Cellars shows constant good quality with their fortified wines, adding this award to their telly of three platinum and two gold Muskadel SA Awards since 2013. “This wine was a real team effort. Orange River Cellars has five cellars where grapes are delivered and we are privileged to use only the best quality,” says Chris Venter, production manager at Orange River Cellars. “The new packaging as well as the Platinum award we received at last year’s Muskadel SA function definitely impacted on our sales,” says Venter. Du Toitskloof Cellar in the Breederivier Valley is well known for their fortified wines. The Du Toitskloof Cellar Red Muscadel 2014 is a 100% Muscat de Frontignan with a plain, yet striking etiquette and excellent aging potential, a definite must for the cold winter nights ahead. “Muscadel is one of our speciality wines and we only produce 5000 litres annually. The grapes used to make this wine come from only one block of vineyard, produced by Peet Smit at Dagbreek, thus we are ensured of only the best quality fruit to make a great wine,” says Shawn Thomson, winemaker at Du Toitskloof Cellar. The Breederiver Valley showed once again why it is the “soetes” capital with a hand full of gold awards: Van Loveren Rooi Muskadel 2015, Rooiberg Red Muscadel 2015, Badsberg Red Muscadel 2014 and De Wet Cellar, who took gold last year as well, won gold for their De Wet Cellar Rooi Muskadel 2014. Boplaas from Calitzdorp in the Klein Karoo won gold for the second consecutive year for their Boplaas Heritage White Muscadel. Last year the Boplaas Heritage White Muscadel 2011 won gold and this year the Boplaas Heritage White Muscadel 2013 walked away with the honours. Tasted blind, the wines are judged and scored according to a tried and tested points system. The uniqueness of the packaging also contributes to the final points tally and often means the difference between a gold or platinum award. Consumers can identify winning Muscats by the Gold or Platinum Muskadel SA stickers on the bottle. Gert Van Deventer (wine maker) and Winifred Bowman (Cape Wine Master).